How do we make the world immortal? By capturing each and every moment in pictures! The pictures speak a world to you and we love to maintain the collection of our dear pictures and snaps. And we can't afford to lose hold of it. But what if, due to some unfavorable circumstances, your phone is reset and you lost all your pictures. The worst case would be of not taking the backup at iTunes or iCloud. How would you then recover deleted photos from iPad? Panic no more! Ultdata is here to pave away your panic and recover deleted photos iPad. 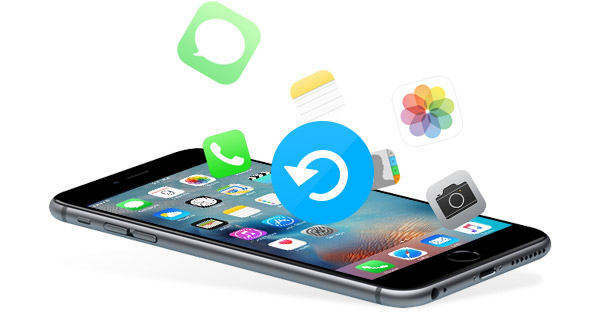 Tenorshare UltData is a phenomenal iOS Data Recovery Software that effortlessly aids the user to recover the deleted photos in iPad. It is Mac/Windows friendly software that not only helps in retrieving the lost photos but also is a retrieval path to various types of data, such as SMS, Call history, Note, Calendars etc. 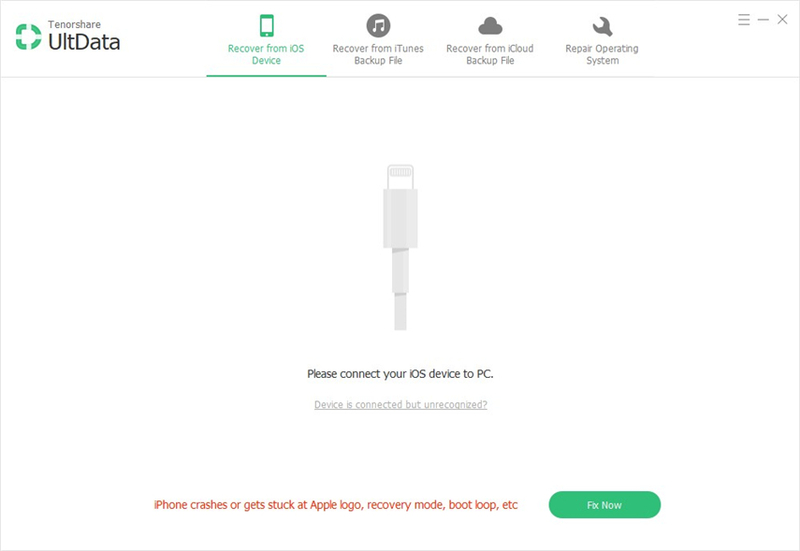 The Ultdata assures utmost recovery of your data in three different ways from iOS Device, iTunes Backup and iCloud Backup. Thus, you can get hold of the pictures you have had lost track upon. With the mighty Ultdata, you can still recover from the pain of losing out not only the photos but retrieve other crucial data types and their backup. We will be discussing in detail regarding how to recover the deleted photos from iPad both with iTunes/iCloud backup and without the backup. 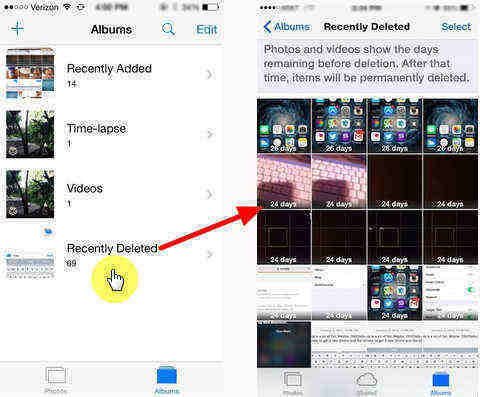 In the following section, we will be learning how to recover the deleted photos without any backup or otherwise. Step 1 – Install the Tenorshare UltData and open it in your PC. By default, 'Recover from iOS Device' mode will be set. Now, connect your iPad with your PC and the program will automatically detect it. Step 2 – From the next interface, you will be asked to select the data types available in your phone to fetch the iPad photo recovery. Hit 'Start Scan' afterwards. Step 3 – After the scan completes, you can preview all the recoverable data that you have selected. To filter out the contents you can tap on the drop down menu that says 'Show All' and then select the 'Display the Deleted Items' instead. Step 4 – Lastly, to recover the deleted photos of iPad, click to 'Recover' and then select 'Recover to Device' or 'Recover to Computer' depending upon your needs. If you have sensibly saved the backup in iTunes, then it becomes very easy to recover the deleted photos from iPad. We have narrowed down the steps through which you can successfully retrieve the photos and other data types with ease. Step 1 –To initiate the process of recovering photos from iPad, you need to select the 'Recover deleted photos from iTunes backup' option. Step 2 – After selecting the mode, you will be redirected to a page where all your iTunes backup files have been listed. Select the one from which you wish to recover deleted iPad photos and then hit on 'Start Scan'. Step 3 – The scan results will be available for your preview on the upcoming screen. This way, you can view all the data contained in the backup and recover the desired one according to your needs. Select the files that you wish to recover. Step 1 – Connect your PC with your iPad using the USB cable. Download the UltData iOS Discovery tool and launch it on your PC. You will see four different options available on the top, you need to hit on 'Recover from iCloud backup' option this time and then sign into your iCloud account. Step 2 – As soon as you sign in to your iCloud account, you will then be provided with the list of all iCloud backups you have on your account. Select the desired one and hit 'Next'. Step 3 – A new window with the data types will come up. Depending upon your needs, you can tick as many data types, as you want. Hit 'Next'. Step 4 – The tool will now download the selected data from iCloud backup and load the results on your screen for your preview. Once done, click 'Recover' button on the bottom right and you will successfully accomplish iPad photo recovery. It becomes nearly impossible to retrieve the data if one does not maintain a backup for the data. However, TenorShare's Ultdata combats this issue and facilitates in recovering photos from iPad. No product comes in line to beat the efficiency of the Tenorshare's UltData. This mighty tool has the ability to recover the lost data, pictures and several data type, you want to name. With Ultdata, a user can recover several other data types such as Messages, Calendars, Notes etc. The user will be assured to successfully make the retrieval without any hassles.